While Jewish Treats has previously discussed the requirements for kosher tefillin (Click here for a full description of tefillin, including the difference between the box worn on the head and the box worn on the arm), it should be noted that the ways in which the tefillin are worn are profoundly symbolic. The actual method for “laying tefillin,” as it is called, is intricate and should be reviewed with a rabbi or one experienced in putting on tefillin. The tefillin shel yad (of the arm) is always placed on the “weaker” arm. Thus righties place them on their left arms and lefties on their right arms. The box of the tefillin shel yad is placed on the inner arm above the elbow, on top of the muscle, and is lined up to aim at one’s heart, the center of one’s emotions and desires. Speaking of heart, many find meaning in the fact that the strap of the tefillin shel yad is wrapped around the lower arm seven times, just as a bride circles a groom seven times beneath the wedding canopy, alluding to the concept that the Jewish people are married to God. Finally, the strap of the tefillin shel yad is wrapped around one’s hand so that the different criss-crossings create the letters shin, daled and yud, Sha’dai, a name of God representing "He Who sets boundaries on the world." The box of the tefillin shel rosh (of the head) is placed centrally just above the forehead (at the natural hairline), while the knot that ties the two ends of the strap of the tefillin rests just above the nape of the neck. 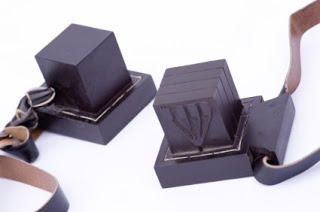 Just as the tefillin shel yad symbolically represents dedicating one’s emotions to serving God, the tefillin shel rosh represents the dedication of one’s intellect to serving the Almighty. This Treat was last posted on January 26, 2012.